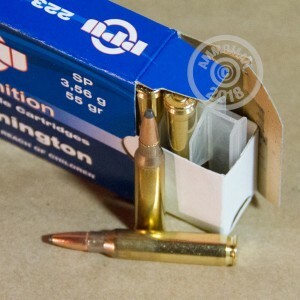 .223 Remington Ammo - 1000 Rounds of Prvi Partizan 55 Grain SP at AmmoMan.com - Free Shipping! Prvi Partizan is a Serbian ammo manufacturer that gets its name from a period during World War II when it supplied "partisans" fighting Nazi occupation in Yugoslavia. These days, however, you're more likely to be facing an occupation of coyotes or groundhogs. Fortunately, Prvi is still here to help--stop the invasion of your backyard with these .223 Remington soft point cartridges! 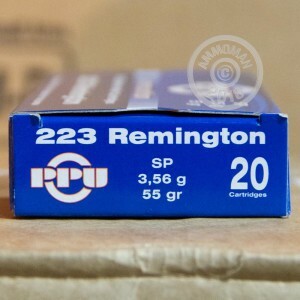 These .223 rounds come in boxes of 20 and work well in both AR-15s and bolt-action rifles. Each cartridge fires a 55 grain soft point bullet at a muzzle velocity of about 3,248 feet per second, giving it very similar ballistics to M193 ball ammo (a big plus for sighting in your optics).